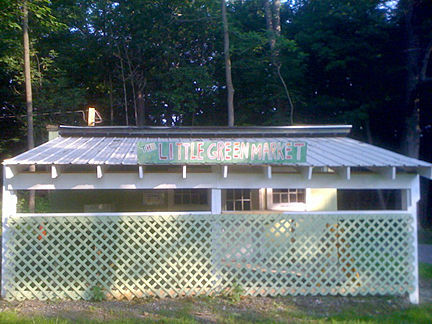 The Little Green Market is open from 10am to 6pm 7 days a week in season which is generally mid-June thru October. Located near the estate Gate House, it has its own driveway and parking lot off of Avon Road just north of the Livingston County Courthouse. The self-service market sells only produce grown by us chemical-free on our Free Soil Farm and hand-harvested every morning. Shop early in the day for best selections! Please feel free to call ahead at 233-5338 for special orders of larger quantities. With almost four acres of vegetables we should be able to supply your needs. If you want to stretch your vegetable dollars, consider joining our CSA to earn substantial discounts!